You are here: Home / Images / Pretoria Image: Murray Park House built for the wealthy pastoralist Alexander Borthwick Murray in 1884. 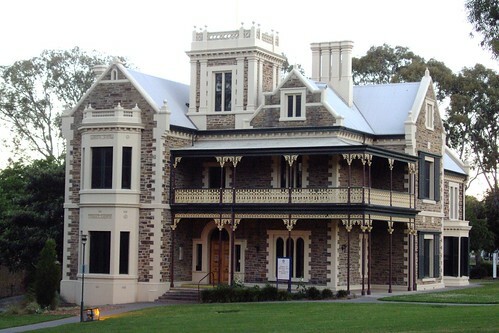 Now part of the Magill Campus of the University of South Australia. AB Murray (1816-1902), as he was often known, actually came to SA to help a fellow Scot James Malcolm who owned Poltalloch Station on Lake Alexandrina as well as leases at Mt Crawford. (The Lake Alexandrina property was later bought by the Bowmans and the WEA runs a history tour to Callington and this station once or twice a year.) AB Murray had arrived with little money but he soon raised a good flock of sheep for James Malcolm and so he bought out the Malcolm’s leasehold at Mt Crawford. He then named his property Murray Vale. Apart from leasehold land he also purchased freehold land from the Barossa Special Survey in 1843 and some freehold land at Magill. In 1841 his brother John arrived from Scotland and in 1843 he also took up land at Mt Crawford. To help you understand the moves and changes of the two Murray families at Mt Crawford and elsewhere in SA you need to look at the family tree information below. Alexander Borthwick (AB) Murray (1816-1903): buried in Adelaide (Magill); married Charlotte Scott (were they the same family that first settled Kersbrook in 1858? ); then Margaret Tinline. •8 children with his first wife Charlotte but only one grew into adulthood, Esther Gault she lived in Lorne Avenue Magill behind Murray Park house. Charlotte died in 1853 and AB remarried in 1858. Charlotte is buried at Murray Vale cemetery. AB Murray left Mt Crawford after Charlotte died in 1853 and moved to Tungkillo and eventually Murray Park House after 1862. •4 children with his second wife Margaret Tinline. Margaret (who married a Downer, and the current Lady Downer ( Alexander’s mother) still lives nearby); Sir George became Chief Justice of SA and never married( died 1942); Charlotte who never married( died a few years before brother George); and another son Malcolm ran Wirrabara station until he died around 1902 before his father died in 1903. John Murray (1814-1886): buried at Mt Crawford. He married Alison Hope. He lived at Rhine Park near Springton. •Son Alick Murray inherited the Mt Crawford house and property until it was resumed by the government. The old home is now the Mt Crawford Forest headquarters and offices. •Son John M Murray inherited Rhine Park. He died 1908. Many of his children are buried at Murray Vale. Son Thomas Hope Murray inherited the Mt Beevor estate near Harrogate. He died in 1906. •Son W. A Murray inherited Cappeedee station near Hallett. •Daughter Helen married Murray Dawson, a relative and lived in the Mt Crawford district in the house that is now owned by Lady Downer. Around 1855 AB Murray sold his Mt Crawford property to his brother John Murray and he built himself a new homestead at Tungkillo. By 1862 AB Murray was conducting his pastoral business from his base on Murray Park homestead at Magill. By then he owned properties such as the Wirrabara run in the north (hence Murraytown near Melrose), Bookpurnong on the Murray River, Tungkillo run where his home base was located and others. AB Murray and John Murray established an early sheep stud in SA in 1843 which led to the development of the Murray Merino sheep. Their stud was the third merino stud in SA after the Hawkers at Bungaree (1841) and the Brownes of Booborowie (1843.) AB Murray became a state politician as well as a local councillor for Gumeracha, a supporter of the Royal Horticultural Society show, and in 1881-4 he built the current Murray Park mansion (replacing an earlier house) on the campus of the University of SA Magill. This impressive house is attributed to the famed architect Edmund Wright. His brother John Murray developed major sheep properties at Rhine Park, Mt Beevor near Harrogate, a property at Sandy Creek near Gawler, and Catarpo and Cappeedee stations near Hallett. Murrays had a major impact on pastoralism across Australia not just SA with their Murray Merinos. After the death of John Murray his various properties passed to his sons who maintained the Murray Merino flocks and studs. It is interesting to note that the Murray family only sold Cappeedee station near Hallett in August 2010 after running it for almost 140 years! Among the many claims to fame for John Murray was winning the Great Exhibition of London prize for fineness and quality of wool in 1862. Murray rams and ewes gained the championship prize at the Royal Adelaide Show for many years. After John Murray died in 1886 his son Alick Murray continued the studs at Mt Crawford and Cappeedee. He also built up one of Australia’s best Jersey cattle studs. John Murray’s Mt Crawford properties did not survive for 140 years. The government resumed some of the land in 1909 for the Mt Crawford forest plantations and the rest in 1920 for soldier settler blocks and forestation. At that time in 1920 the main Murray stud was moved to Cappeedee station. AB Murray’s sons also had a great impact on SA. Malcolm ran Wirrabara run until he died and then in 1910 his surviving brother George sold that property. George Murray went into the law finally becoming Chief Justice of SA. He was knighted for his services to SA but Sir George Murray never married and left the bulk of his estate to the University of Adelaide with special bequests for the George Murray Union buildings for men and the Barr Smith Library. He also established the Tinline Prize for history students at the University of Adelaide. He lived until his death in 1942 in Murray Park House at Magill.